The C64 has a built-in character set that is located in ROM, but it sometimes better to use a user-defined character set. In the TRSE IDE, you can create your own regular color/multicolor character sets and export them directly to be included in your Turbo Rascal source files. In the tutorials project, double click on “charsets/tutorial3.flf” to view or edit this particular charset. Fluff (*.flf) files are TRSE binary files, and are all editable in the TRSE IDE image editor. However, to use this images in your c64 project, you will mostly have to export the files to binary format (“Export Bin” button). The exception is files from the TRSE Level Editor, which can be included and loaded directly on the C64. 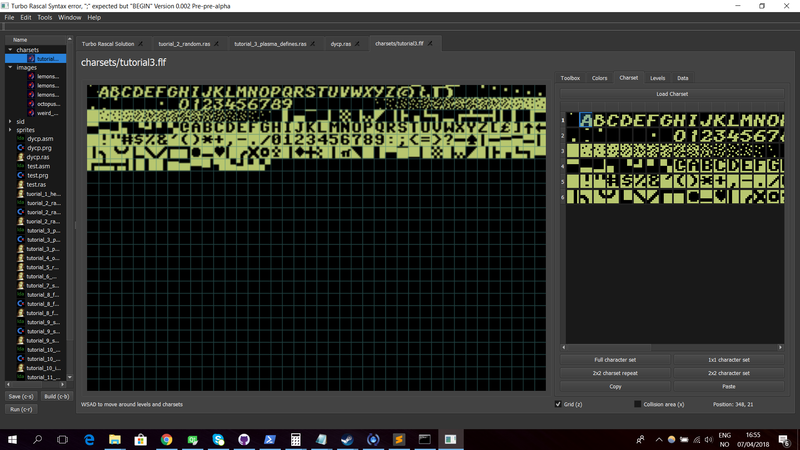 Note that this particular character map has a different font than the standard C64 font, and in addition has blocks from character 64-96 that are “gradients”. These gradient chars will be used to draw the actual plasma, since actually drawing individual pixels would be completely out of the question in terms of speed. Note that the charset is now located at $2000 (actually, $1fff, but whatever), which we will point to later in the code. @ifdef blah / @ifndef blah: if not defined, if defined. Only include the following code block if “blah” is previously defined. In this tutorial, we define a “y_start” as “5”: the y-position where the plasma is going to start. In addition, we define “include_color” to be “true” (could be anything, just needs to be defined). If you comment out this line, the ifdef-block defined in the “Plasma”-routine will ignore color filling, and the whole effect is sped up. // Remove the following line to ignore colors! much faster. in order not to confuse x/y with other parameter names. VIC_DATA_LOC contains information about the location of the custom character set. Since we included our set at $2000, we need to point to this location. The lower 4 bits of the location (8 of $18) does exactly this. It assumes the character set is located at a value $400*lower_nibble, which in our case is $400*$8 = $2000.